"Groundbreaking result" of astronomers' long effort to photograph a black hole to be unveiled April 10. Humanity could be days away from seeing the first-ever photograph of a black hole. We've seen countless illustrations and simulations of black holes in recent years but never an actual close-up photo of one. That could change Wednesday, when scientists will gather in six simultaneous press briefings around the world to unveil the "groundbreaking result" of a yearslong effort to capture images of the black holes at the centers of our Milky Way galaxy and a neighboring galaxy. The U.S. press briefing will be held at 9 a.m. Eastern at the National Press Club in Washington, D.C., and will be livestreamed here. It will be hosted by the National Science Foundation and the Event Horizon Telescope (EHT), an international collaboration that's been working to photograph a black hole using eight linked radio observatories around the world to form a single Earth-size telescope. The scientists involved in the effort declined to discuss the result in advance of the press events, which will be held in Brussels, Santiago, Shanghai, Tokyo and Tapei as well as Washington. But the result is believed to be based upon a vast trove of data from observations made in April 2017 of Sagittarius A* (pronounced Sagittarius A-star), the supermassive black hole lying 26,000 light-years from Earth at the center of the Milky Way, and another supermassive black hole at the center of the neighboring Virgo A galaxy. What might that look like in a photo? Physicists have hypothesized that it might look like a dark area over a bright background — essentially the "shadow" of the black hole projected onto the matter swirling around it. 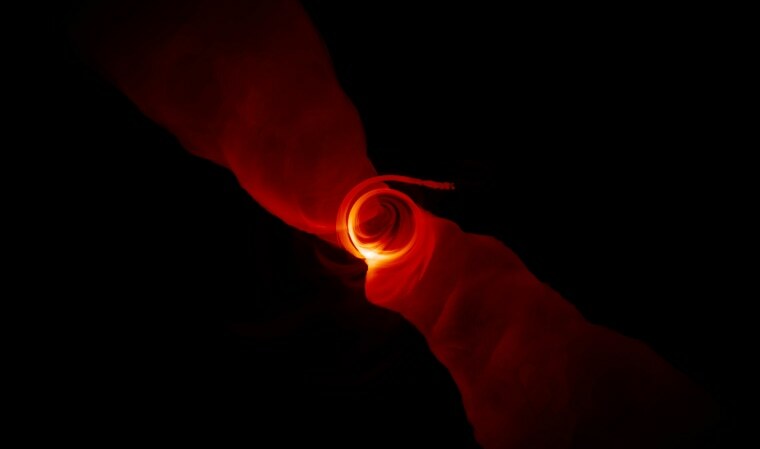 "They have always aspired to image a black hole "shadow," and the best bet is that they have accomplished this feat," Roger Blandford, a Stanford University astrophysicist who is not part of the EHT collaboration, told NBC News MACH in an email. "You can think of a black hole as being like a hand lens on which you have painted a black disk. What you see depends upon what is shining behind and around it." Blandford said he would be listening in on the briefing, adding that he would be "thrilled" to see an image of a black hole. "When I first got interested in black holes as a student, I never imagined that such a feat would be possible."